I didn’t have anything new made for this weeks share, so I pulled something from the archives that has been a favorite of mine. This bag was featured in Somerset Haute Handbags last year. 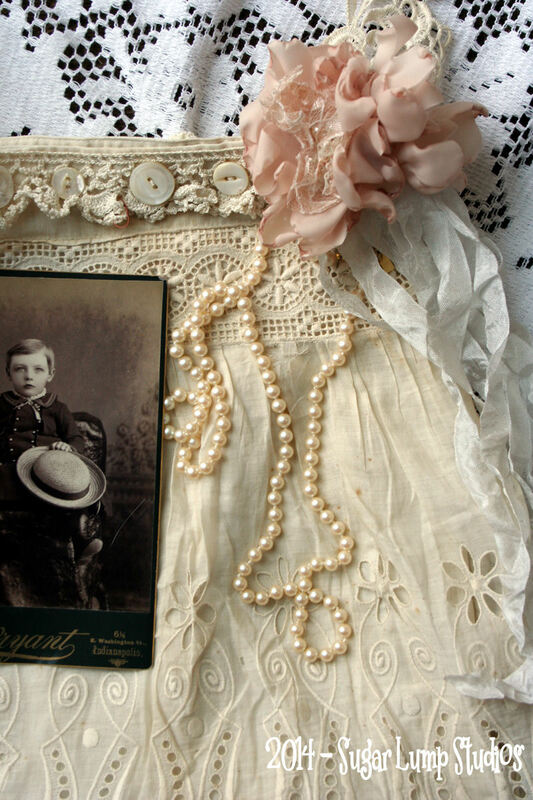 I created it using a Victorian petticoat flounce ruffle. Bascially, it is a muslin bag that I added the ruffle to the front of. 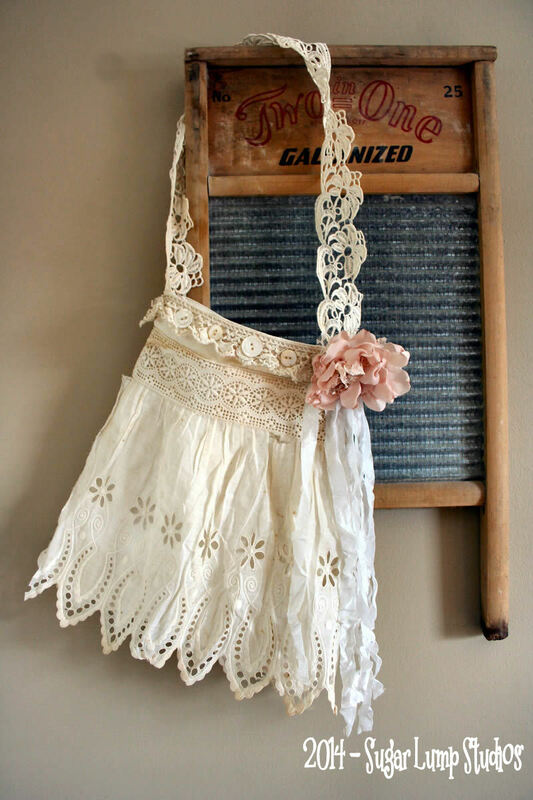 A beautiful piece of vintage wide lace for the shoulder strap and a handmade flower. 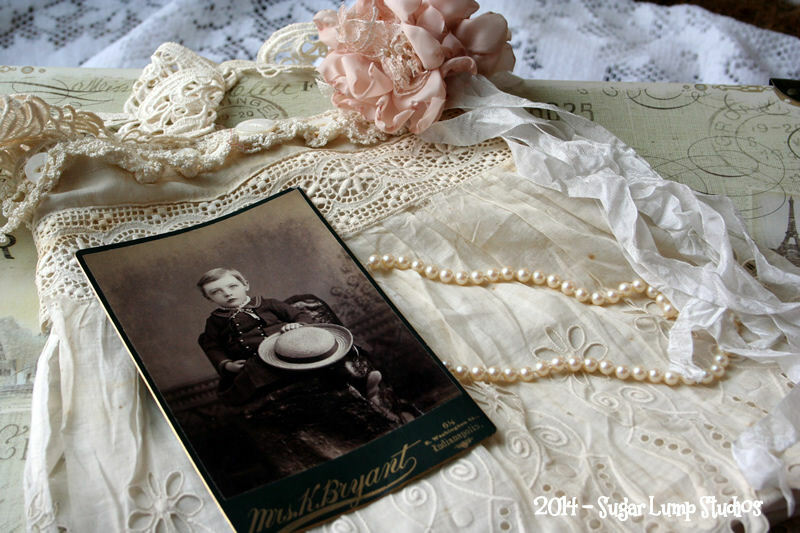 The cabinet card I photographed it with has long been a favorite of mine. Nancy, it is a most beautiful bag, so romantic and so very lovely, with all the old laces, and your amazing handmade flower. Ofcourse it should be featuren in Somerset Haute Handbags, for all the readers to sigh, and enjoy. A wonderful neutral and your sweet card, too. This bag is beautiful and very romantic, Nancy! No wonder it made it into one of the wonderful Stampington publications. I love that vintage wash board too. Have a pleasant week :) ! Simply elegant~ So breathtaking Nancy. I am once again sitting here and *sighing* over your beautiful work. So glad Stampington featured this gorgeous vintage bag! for all to see. I absolutely adore your gorgeous bag, dear Nancy. So romantic and I’m not surprised it got published. So very well deserved. Have a lovely week. Oh so lovely share of beautiful neutrals! Nancy I love that delicate bag! Hope you are enjoying the fall season! Hugs! All so beautiful. Your little bag is truly a fun piece. I have an old childs skirt, very similar I should sew up the bottom and put it to use. 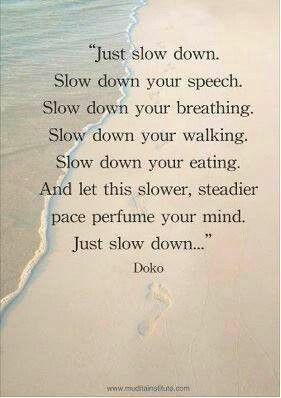 I kind of needed the Just Slow Down verse. seems things here are way to hectic. A list a mile long and I thought last month has issues. High winds and cold temps have arrived making me glad we spent a wonderful Sunday outside, getting ready for this next season. Enjoy a great week. 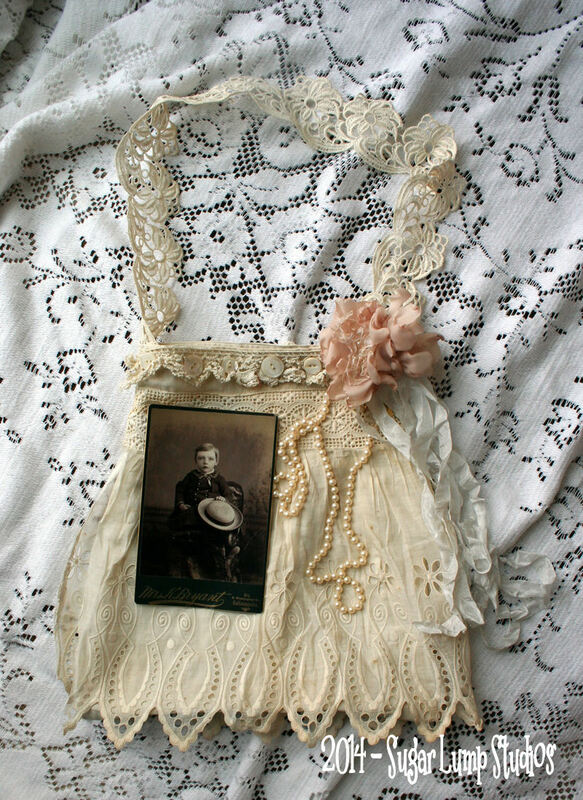 The bag really is gorgeous, the broderie anglaise trim you used on it is exquisite and one of the prettiest I have seen. 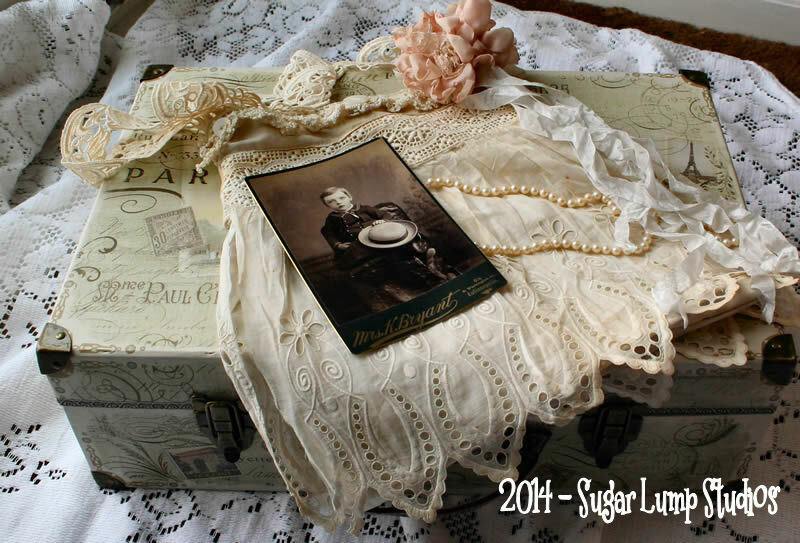 Your bag is just exquisite vintage yumminess, and I love the expression on the boy in the cabinet card. He’s sweet. Your blog is gorgeous and your photo presentation too. I can see why Somerset liked your bag! How exciting for you.